All HQ Props come packaged with two props per bag and one set of adapter rings. HQ Props have become extremely popular for use in multirotors, especially in the smaller 180mm to 250mm FPV Racing Quads. These props are available in a wide variety of sizes, colors and materials to allow you to get the best match for your multirotor aircraft. All of HQ Props are available in both normal and reverse rotation as needed for use in multirotors. The standard props are made with a glass fiber fill for extra strength and durability, and come in Black, Green and Orange colors. The Carbon Composition props feature a carbon fiber fill for extra stiffness, and are only available in black. These props have an oversized center hub for extra strength that measures 14.8mm in diameter by 7.5mm thick. The hub has a slightly undersize 5mm hole molded into the front of the hub, and a 9.5mm diameter recess in the back of the hub to accept prop shaft adapter rings. Also included with the prop is a set of adapter rings which fit into the recess on the back of the prop hub to reduce the center hole to 3, 4 or 5 millimeters. Before installing the prop, the molded center hole should be slightly enlarged with either a 5.0mm, #8 or 13/64" drill bit for clearance. If you have a larger threaded shaft on your prop adapter, the center hole can be also be reamed out to 6mm or 1/4 inch as needed. 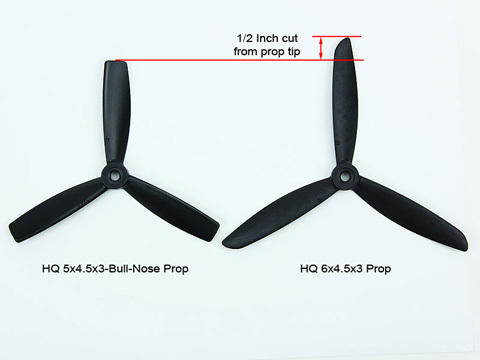 The photo below shows an HQ 5x4.5x3 Bull-Nose prop next to a standard HQ 6x4.5x3 prop. Both props have the same blade shape, but the 5x4.5x3 is molded with the prop tips cut 1/2 inch shorter than the 6x4.5x3 prop.